This book has been discontinued. It is available in print only when listed as an option. We are authorized by the publisher to provide the book in PDF format. When you purchase the PDF version, even though it is listed as provided through a download, we will email it to you. We will also provide the book on CD for an extra $5. We will list this when available--if you prefer the book as a PDF on a CD, let us know if it's not yet listed. We will also provide the book in reprint form, not as originally bound, but in a plastic ring binding. 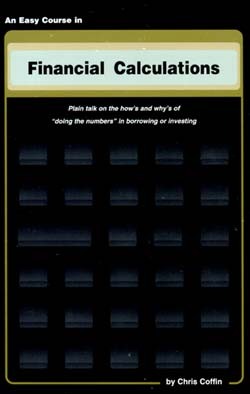 This book is a good resource to purchase along with any financial calculator like the HP12C, HP17BII, or HP19BII. Plain talk on the how's and why's of "doing the numbers" in borrowing or investing. The Easy Course is Grapevine's all-time best-selling collection of explanations on compound interest and how to use it, including clear, straightforward treatments of all of the topics listed below. 5.5" x 8.5", 176 pp. "...none of the others make it as clear and easy. It's terrific." "The language is the key..." "This presentation is superb!"